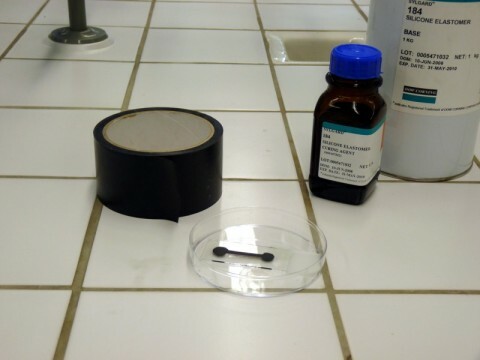 This simple instruction describes how to make homemade microfluidic devices without any expensive clean-room facilities. 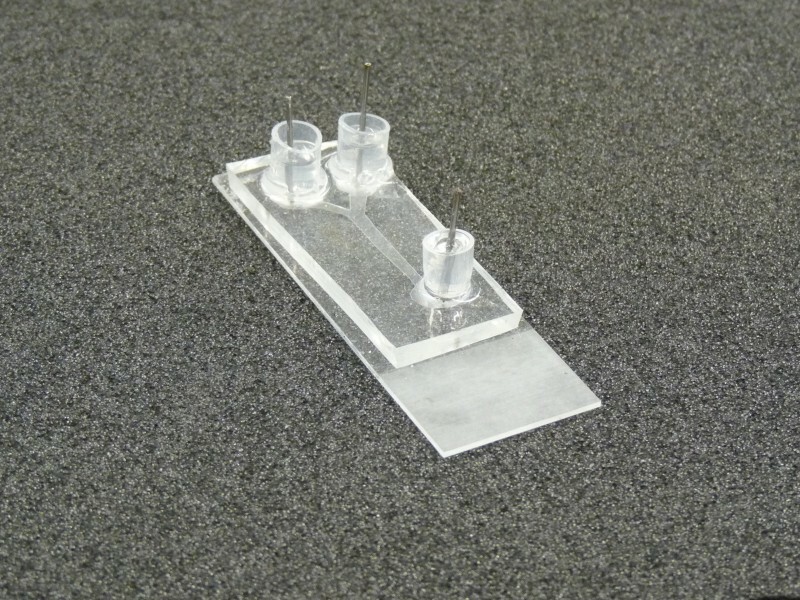 Masters for casting PDMS microfluidic channels can be cut out by hand from adhesive tape and used as molds repeatedly. Allthough the accuracy is limited, the method described here can be used for fast experiments using uncritical dimensions of the fluidchannels or most importantly for educational purposes and student projects. Introduction – Why is this useful? Microfluidic devices are generally manufactured by comparatively complex methods such as etching and photolitography, requiring expensive facilities and user expertise. This short instruction describes a process to create very simple molds for casting PDMS microfluidic devices. 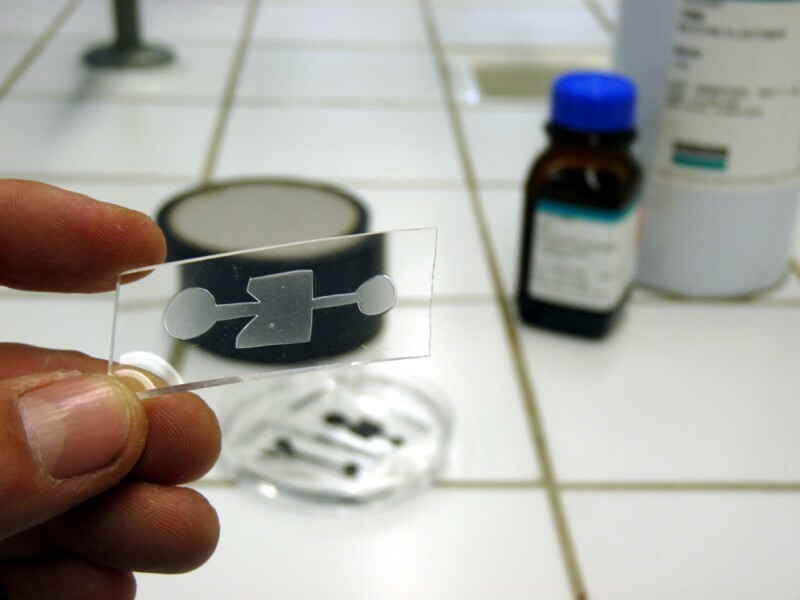 Masters for casting PDMS microfluidic channels can be cut out by hand from adhesive tape and used as molds repeatedly. Allthough the accuracy is limited, the method described here can be used for fast prototype experiments using uncritical dimensions of the fluidchannels or most importantly for educational purposes and student projects. Recently various techniques have been described that broaden the access to such microfluidic devices by simple processes of fabrication, which can be performed in laboratories without any expensive equipment [1, 2]. The open access to these instructions such as published in Chips and Tips and other online resources can most directly be used as educational tools for classroom activities and inspire creative student projects , but might also inspire innovative solutions to diagnostics in developing countries [4, 5], and even further be used by a broader community of hobbyists, hackers and artists [6, 7] to develop new interesting applications outside of academic research labs. Materials - What do I need? Method – What do I do? 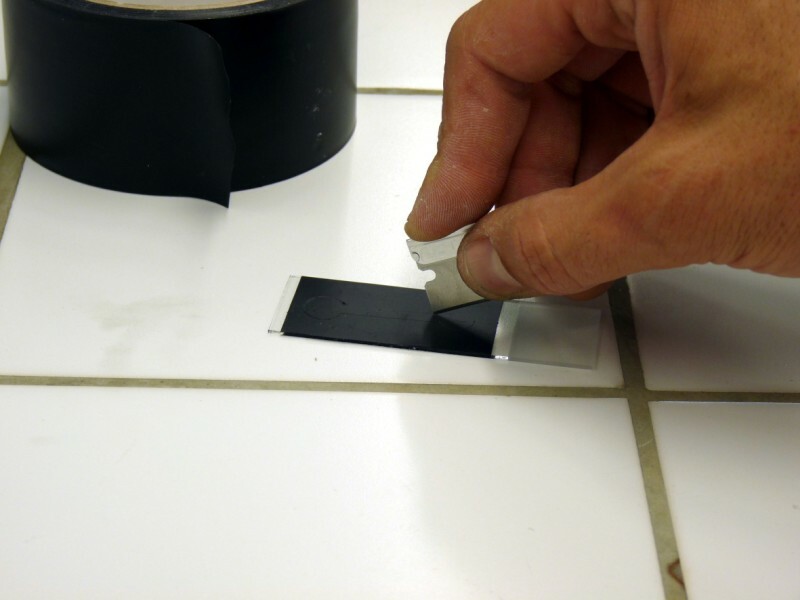 1: Stick adhesive tape to a glass slide and press it tightly without enclosing any bubles. 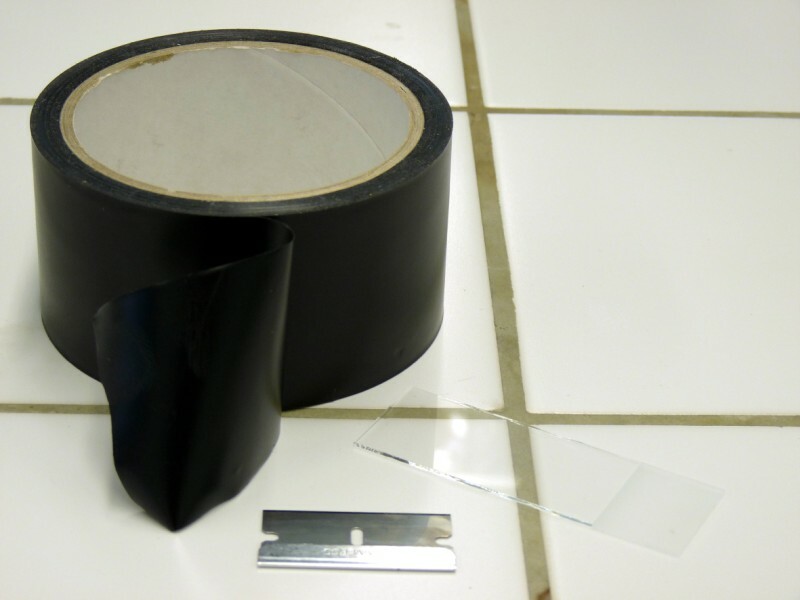 Electrical insulating tape, simple household tape and others have been tested to work. 2: Cut out the desired channels using a sharp blade (Fig 2). Larger circular areas can be cut for inlets and outlets. 3: Carefully peel off the surrounding tape (Fig 3). 4: Place the tape/glass mold into a larger mold such as a petridish (Fig 4). 5: Mix and cast the PDMS over the mold by your favorite procedure. If you do not have access to a vacuum just leave the PDMS setting for a few hours after mixing to get rid of the bubbles. 6: Cure it in the oven following your favorite recipe. A simple kitchen toaster oven can suit perfectly aswell. In the case of no access to an oven, just leave ot to cure for 2 days at room temperature. 7: After cooling down, gently peel off the PDMS device (Fig 5). The tape stays on the glass slide most of the times and the mold can be used repeatedly until the glue of the tape has degraded. Up to 10 times has been tested. 9: A simple method to bond such large channel devices is wetting the contacting surface with uncured PDMS by stamping it onto a flat surface prepared with a thin film of PDMS. This can be achieved just by wiping it with a tissue soaked in uncured PDMS. And then subsequently placing it onto a clean glass slide and curing it for another time in an oven. General experiences: In some cases after repetitive use of the same mold the tape has peeled off, but could easily be stuck back to the glass. Testing of various different tape manufacturers showed that some were slightly dissolved during the curing process and only could be used a single time. In that case a layer of uncured PDMS remained on the surface of the channels, which can be mechanically wiped off using alcohol and tissue. 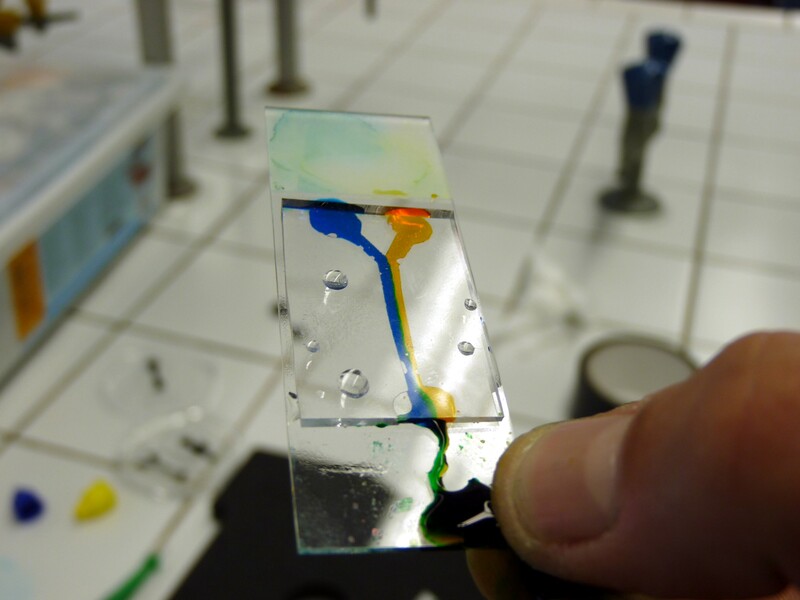 Simple experiments: We have already used these devices as an experimental platform for education to demonstrate concepts of microfluidics, such as laminar flow, capillary forces and pumping (Fig 6 c). Most students can easily follow the protocol and bring up new ideas of designs (Fig 6 d). 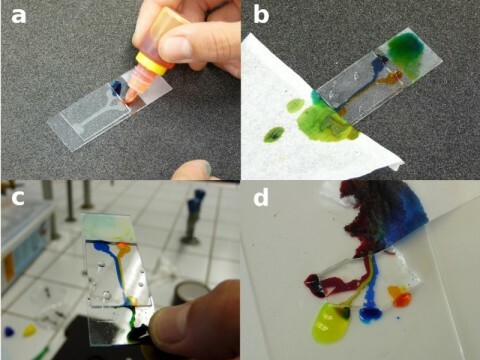 The liquids were filled through the channels by capillary action (Fig 6 a) and could be further pumped through by soaking a piece of tissue at the outlet (Fig 6 b). Further improvements: The devices manufactured as described here can be further improved by the addition of stable tubing connectors using protocols described elsewhere in Chips and Tips. 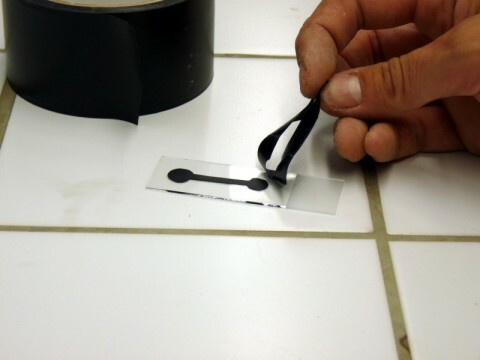 Multi-level channels: The ease of manufacturing using the tape method described here should also allow the fabrication of channels with variable channel heights by just using several layers of tape at the desired postions. This could be intereting for particle seperation and other applications. 1.Grimes A, Breslauer DN, Long M, Pegan J, Lee LP, Khine M. Shrinky-Dink microfluidics: rapid generation of deep and rounded patterns. Lab Chip. 2008 ;8(1):170-172. 5.Martinez AW, Phillips ST, Wiley BJ, Gupta M, Whitesides GM. FLASH: A rapid method for prototyping paper-based microfluidic devices. Lab Chip. 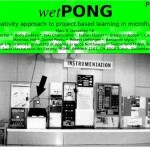 2008 ;8(12):2146-2150.
wet PONG introduces a creativity approach to project based learning (PBL) in microfluidics using a game concept, inspired by computer games, and the use of open-source software and hardware. This work by dusjagr is licensed under a Creative Commons Attribution-ShareAlike 2.5 Switzerland.